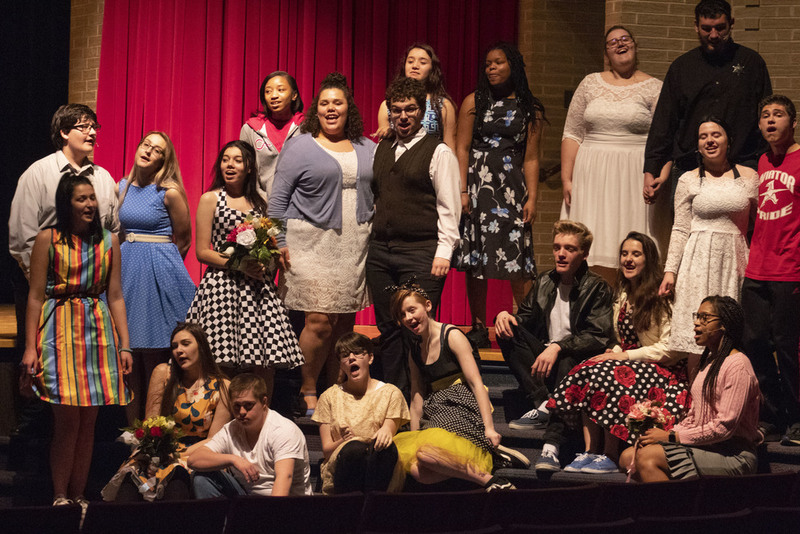 Alliance High Schools rendition of “All Shook Up” began Thursday night with the audience enjoying the 50s themed musical put on by the cast and crew. Directed by Carrie Chunat, the musical featured the hit songs of Elvis Presley entwined with a fun plot set to make every audience member laugh. Rachael Wagner and Ryan McKnight lead the show as Natalie and Chad. Chad, a no-good roustabout with music in his soul, arrives in a small town set in its ways. Natalie falls for him upon first sight and will do anything she can to make him fall for her, even if it means taking on another persona to draw his eyes away from the intriguing Miss Sandra, played by Savannah Heller. The show featured appearances from AHS’ very own Principal Shawn Jackson and Alliance City Schools administrators Superintendent Jeffery Talbert and Assistant Superintendent Jason Dixon. If you missed opening night, there are still three more chances to see the performance: tonight and Saturday at 7:30 p.m. and Sunday at 3:30 p.m.
Tickets are available online at https://singingaviators.ludus.com/index.php or at the door. Tickets are $8 for students, $10 for adults and $8 for senior citizens.